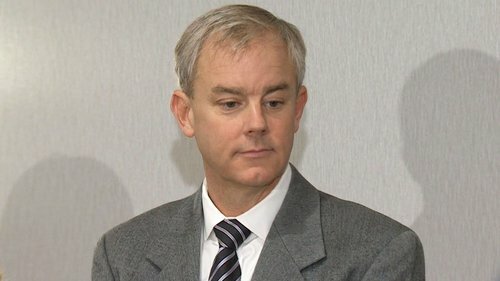 A new trial of Dennis Oland is set to start Wednesday at 9:30 a.m. in Saint John Court of Queen's Bench. Judge begins with formal re-arraignment of #Oland . "How do you plea?" asks court clerk. "Not guilty," Oland replies, with lead defence lawyer Alan Gold at his side. Oland is not seated in the prisoner's box, but rather at a small table beside it. His lawyers requested this. Crown objected. Judge granted it. 2009 Dennis and his former wife went through a costly divorce. Was at risk of losing family homestead. Father bankrolled his divorce, to his surprise, given strained relationship, she says. Richard Oland was planning a trip with Sedlacek on July 6, she says. Dennis arrived at his office around 5:45 p.m. that day, according to Richard's secretary Maureen Adamson. They talked about family tree. Dennis later told police he left around 6:36 p.m. and headed home toward Rothesay, stopping at Renforth wharf along the way. eg. Rolex on wrist, wallet, keys to BMW, cash etc. Dennis Oland's defence lawyer Alan Gold is giving an opening statement this time. Defence did not do so at the first trial. Having the jacket cleaned was consistent with the upcoming visitation and funeral for his father, he suggests. The drycleaning tag was still attached and receipt also found - no effort to hide them. Adamson discovered Richard Oland's body in his Canterbury St. office on the morning of July 7, 2011. He was face down in a pool of blood. She found the street-level door of the building unlocked and the door at the top of the stairs ajar. No reply to text either. She called his house, where she reached him. He was a bit late, but arrived quickly, she says. The meeting was re. life insurance, the court has heard. Around 'noon-ish' she left to pick up some lunch for him - all-meat pizza and a can of Coke from Pizza Hut at Brunswick Square, she says, without hesitation. "It sounds like you might have done that before," remarks Veniot. Oland loved all-meat and she loved veggie, she says.